When it comes to finding protection and a safe feeding ground, fish rely on towering blades of seaweed, like kelp, to create a three-dimensional hiding space. Kelp forests have been shown to be one of the most productive systems in the ocean with high biodiversity and ecological function. However, in recent decades, many kelp habitats have been taken over and replaced by lower turf-dominated seaweed species. Researchers at the University of New Hampshire have found that this change in the seascape may impact the behavior of fish and could be leaving them less options for refuge and more vulnerable to predators. 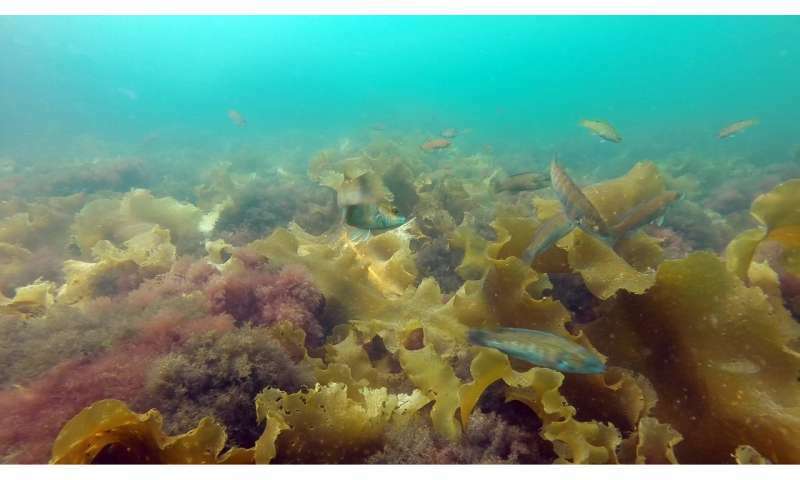 "In each case, the cunner preferred and sought out the kelp, or similar seaweed species, to hide in," said Jennifer Dijkstra, research assistant professor in the Center for Coastal and Ocean Mapping at UNH. "Over and over, they gravitated to the kelp that is taller and because of its blade-like structure, provides a canopy to hide under." Three experiments were conducted as part of the research recently published in the Journal of Experimental Marine Biology and Ecology; in situ video observations, a refuge choice study, and a foraging efficiency study. The video of cunner, a residential mid-trophic level fish, in their habitat showed that the fish preferred the kelp almost three times as much. The refuge choice experiment, where different seaweed scenarios were created for them to hide, supported the video observations that in all cases, kelp was the refuge of choice. The foraging efficient study showed very little difference between seaweed habitats. "Our results suggest that the refuge-seeking behavior of the cunner may be impacted by the ongoing shift we have seen in our earlier studies of the increased dominance of the Dasysiphonia japonica (invasive seaweed) in the southern Gulf of Maine," said Dijkstra. "By losing their preferred refuge, the tall canopy-forming kelps, cunner were left with little option but to use the lower invasive seaweed turfs, which could give them less protection." Three species known to be predators of cunner—striped bass, pollock, and harbor seals—were seen on the video highlighting the real threat to cunner in the surveyed habitats. Researchers say while this study did not directly measure predation, they believe that cunner may become more vulnerable prey since they were easily seen by the researchers hiding in the lower, less dense seaweed. Researchers also note this could be even more detrimental to juvenile cunner who look for safe refuge more often. While further studies are needed, they caution that continued reduction in available kelp cover may signal the beginning of density-dependent mortality in cunner populations which may have cascading effects on other members of the Gulf of Maine ecosystem. Dijkstra and her team previously published a study that looked at seaweed populations over the last 30 years in the Southwestern Gulf of Maine and found the once predominant and towering kelp seaweed beds are declining and more invasive shrub-like species have taken their place. 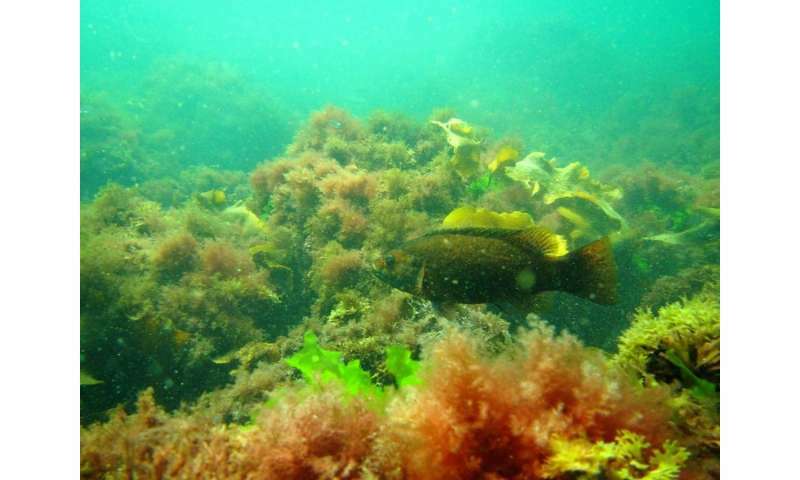 The invasive fiber-like red seaweeds had covered up to 50 to 60 percent of some areas, altering the look of the ocean floor and the base of the marine food chain.